Looking to ease in to the art of taxidermy along with major cute-factor? Our brand new taxidermy mouse class is jammed packed full of “aww” and led by our master taxidermist. Small mammals are often the best specimens for learning with, and being instructed by a master with decades of experience doesn’t hurt either. In this comprehensive one day class, You’ll learn techniques from skinning to sculpting forms and adding the oh so important finishing touches. 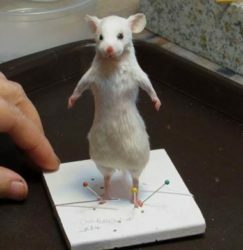 By the end of the day, you will have a tiny taxidermy friend sure to bring the warm fuzzy feelings to just about anyone.